This easy-to-operate unite combines TENS and EMS therapy in one digital device. 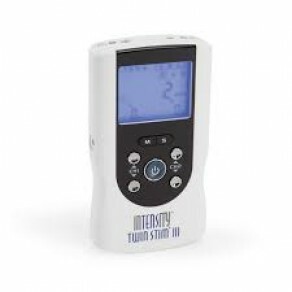 The InTENSity™ Twin Stim® III combines TENS and EMS therapy in one beautiful digital device. The TENS has 4 Modes (Burst, Normal, Mod1, Mod 2) and the EMS has 3 modes (Synchronous, Asynchronous and Delay). This device is an industry leading 105mA.